Civita Comfort: Made from the same ultra-soft polyester blend fabric as our Civita Day Pack, our sturdy Civita Hidden Pocket provides hassle-free pickpocket security for those who'd rather not wear a moneybelt or neck wallet. 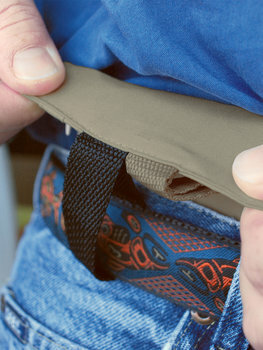 Uses Your Own Belt: Run your belt through the sturdy black or khaki loop (whichever matches). Then flip your Hidden Pocket down inside your pants, and slide it around to find your "comfort zone." Deep Storage: The main zippered compartment features a moisture-barrier liner — perfect for "deep storing" your passport and rail pass. 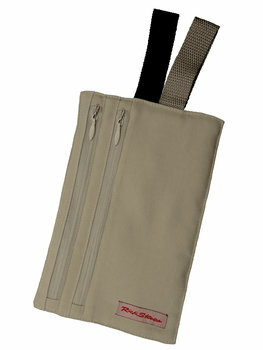 Card/Cash Access: A second zippered pocket lets you easily access your cash and credit cards as you need them. Relax: When you wear your Hidden Pocket, feeling a street urchin's hand in your outside pocket becomes just one more interesting cultural experience. Your Choice: Our Silk Hidden Pocket shares the same dimensions and features, but is made from comfortable spun silk. 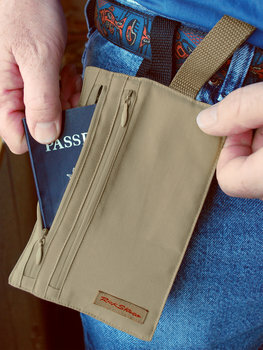 Or, go with our Civita Neck Wallet or Civita Moneybelt. Dimensions: 4 ½" x 7"